As I have written before, health logistics as a discipline tends to ignore the impact of the logistics of daily life on health. Possibly the clearest example is how physical access to primary health care impacts on health. What do you do when you are seriously sick? Well, most of us in the developed world would go to a doctor. But what if that doctor is a four-hour trip away? Even here in Australia, a developed country by any account, access to health care is much worse in remote and rural areas than in the cities, and the health outcomes are as can be expected. Similar results have been shown in studies in other developed countries. Obviously, things are much worse in developing countries. That four-hour trip suddenly translates in four days (or more) on the road, or rather, on a muddy track, on your own feet or bumping along on the back of some animal instead of a smooth ride in a car or train. The health outcomes are horrifying. For instance, a recent study in Ethiopia suggested that urban elderly Ethiopian women had about a 1.6-1.8 times longer life expectancy than rural ones. Or this one: the rural areas around Kunming (China) suffer from 50% more premature deaths than the city itself. Solutions obviously need to be found, and some are already being implemented. Foremost, we need to concentrate more of our preventative efforts on less accessible areas. Of course, that is easier said than done: the same issues confronting a patient searching medical treatment, are hindering outreach and health education efforts — and when it comes to e.g. water and sanitation efforts, the logistics issues are even worse. Another way to deal with these issues is by decreasing the distance between patient and health care. There are basically two ways of doing so: by bringing access points to the patients, or by bringing patients to the access points. The former can be done by more dispersed access points, or by mobile clinics. Both have some serious drawbacks. Peripheral health access points are either unable to cope with more serious complaints, or would have to be impossibly well-equipped in a setting that is resource poor — you cannot put a secondary hospital in every hamlet, definitely not in a resource-constrained setting like a developing country. Mobile clinics can be slightly better equipped and resourced, but are only occasionally available to any given population and hence cannot deal with e.g. many emergencies, simply because they are not there when the emergencies occur; moreover, they are a shocking waste of time for the health care professionals, who spend much of their working hours trekking from one place to the next instead of on patient care. Bringing patients to the health care settings is something that is rarely done. 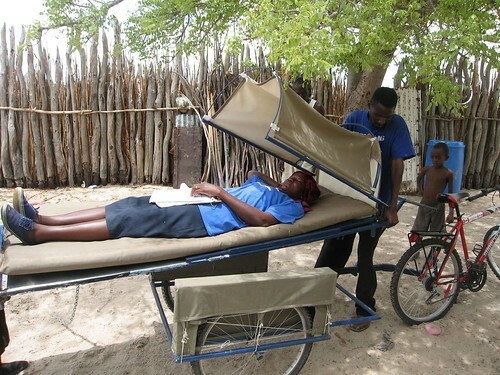 In developed countries we do so using individual patient transport (e.g. ambulances or commercial patient transport), but that is not an option for developing countries. Another way would be to use communal patient transport. Imagine a bus (or animal-drawn cart, or a caravan of donkeys or camels…) making scheduled rounds along a number of reasonably short circuits, picking up patients and delivering them to the nearest health care facility, and returning them on the next round after treatment. It would still not solve the problems of emergency care, but for the less acute cases it would bring patients possibly faster and more comfortably, but definitely at less cost for them to the care they need — without wasting a valuable and scarce resource, health professionals’ time. Obviously there are issues around it that need to be solved, but it seems to be a intriguing possibility with many possible advantages. I know it has been done at very small scales, e.g. in refugee camps and in the immediate surroundings of some health posts here and there, but as far as I know it has never been tried in a larger area (but I would be chuffed to be corrected). High time for a trial, I would say.